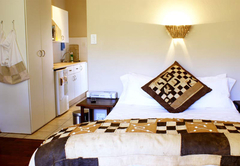 Dunkelly is a highly recommended property providing self catering in Irene for tourists visiting the Northern Gauteng region. 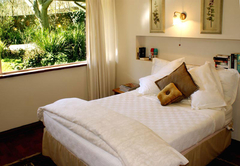 Situated between Midrand and Pretoria in the quaint, picturesque and secure village of Irene, Dunkelly can be found nestled in a country village steeped in history and surrounded by nature. Irene offers a surprisingly rustic interlude in the middle of the country’s urban heartland. A garden suite which can sleep up to four people with private garden and patio. This comfortable and spacious unit is well suited to guests requiring accommodation for more than just a few days, as well as to families, as the lounge converts very easily into a second bedroom with two single beds. This elegant unit is tastefully furnished and decorated with African fabrics and artifacts all set off beautifully against stunningly restored Rhodesian teak parquet floors. 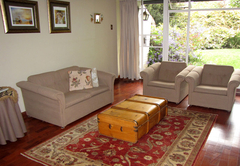 Completely refurbished in 2004, it is clean, crisp, uncluttered and spacious. This unit is tasteful and elegant and furnished with antique Teak pieces which beautifully set off the white bed linen and oriental carpet on the floor. Dunkelly Garden Suite is very comfortable, the unit is popular because of its incredible spaciousness. 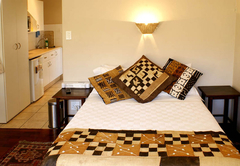 The suite has a bedroom with a double bed and an electric blanket. The bathroom has a bath and a shower. 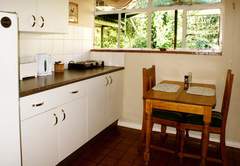 The kitchen is fully equipped, the lounge has a TV (M-Net) and WiFi. 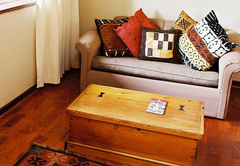 Double apartment, is elegant unit is tastefully furnished and decorated with African fabrics and artifacts all set of beautifully against the stunningly restored Rhodesian teak parquet floors. 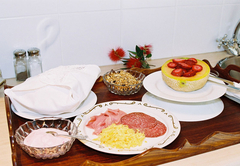 Completely refurbished in 2004 it is clean, crisp, uncluttered and very spacious. The open-plan bedroom has a double bed, a seating area and a kitchen. The bathroom has a shower, basin and toilet. There is a kitchenette with a bar-fridge, microwave, kettle and toaster. This apartment is tasteful, elegant, clean, crisp and uncluttered and is furnished with antique Teak pieces which beautifully set off the white bed linen and which is all brightened up with an oriental carpet on the floor. There is an open-plan bedroom with a three-quarter bed and a kitchen. 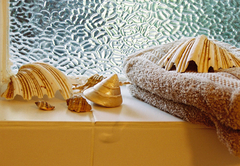 The bathroom has a shower, basin and toilet. 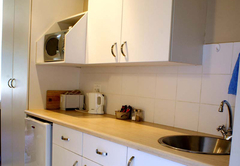 There is a kitchenette with a bar-fridge, microwave, kettle and toaster.